HPANWO: NASA Bombs the Moon! I’ve noticed a worrying trend in the last few years related to the world of space exploration. More and more often it includes missions that involve acts of violence. The first to come is the proposed Juno spacecraft (http://juno.wisc.edu/) which was originally going to be launched this year but has been put back to 2011. It’s mission is to explore the moons of Jupiter and to end with the craft nose-diving into one of the volcanoes on the Jovian moon of Io, so gathering data on the satellite’s interior before the craft is destroyed. A mission that has already taken place is Galileo, again an exploration of the planet Jupiter. This mission ended with the craft crashing onto the actual planet at the huge speed of 50 kilometres-per-second in a fiery, all-American blaze-of-glory finale. This action is planned to be repeated by the Cassini probe currently exploring the space around the planet Saturn. As you will see if you read the above background articles, I suspect that this may have something to do with the Lucifer Project, a possible Gotterdammerung Manoeuvre by the Illuminati, to be executed in conjunction with the Large Hadron Collider; see here for background on Gotterdammerung: http://hpanwo.blogspot.com/2008/03/large-hadron-collider.html . Along with Gotterdammerung, there may be another motive behind this new tactic in NASA’s activities in the Heavens: muscle-showing. In 1945, the United States used its new ultimate weapon, the atomic bomb on Japan. This act has been justified by saying that it was necessary for the ending of the Second World War, but this has been shown to be false many times. (It has also shown that there is no depravity that a crafty government will not stoop to, and be able to get away with, if it has a loyal media, a gullible populace and well-structured psychological propaganda system). Hiroshima is sometimes called “The last shot of World War II- and the first shot in the Cold War.” The Americans could foresee the coming conflict with the Soviet Union in the post-war world and wanted to give the Russians a warning: “This is what we can do to you too if you challenge us!” was the message. Now although history progresses over the years political strategy models change very little. We can see the same strategy models being used centuries apart in very different places, cultures and circumstances (EG: the Plantation of Ulster and the Asylum-Seeker scandal: http://hpanwo.blogspot.com/2008/11/british-national-party.html). So lets apply the above tactic to the present day. A big secret that our governments keep from us (Not THE biggest!) is that planet Earth is some kind of oasis of life in an inanimate universe. Other planets in our solar system are just dry dustbowls and beyond is nothing but gas clouds and fusing hydrogen. This is a complete lie. The solar system is regularly traversed by spacecraft from extraterrestrial civilizations, and the governments know it. They actually treat these extraterrestrial civilizations as they quite openly treat foreign nations of Earth. 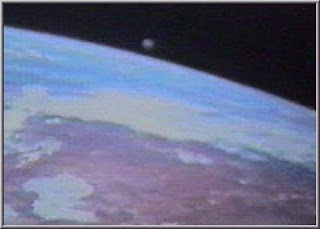 They have embassies, lines of communications, summits and military strategies; see: http://hpanwo.blogspot.com/2009/03/day-after-roswell-by-col-philip-j-corso.html). This is known by the term “exopolitics” and I’m glad to say that people and organizations outside government are today demanding a role in it. Like two of my friends Paola Harris (http://www.paolaharris.com/home.htm) and David Griffin (http://www.exopolitics.org.uk/). The problem is that currently the government are treating the aliens rather like the Cold War adversaries treated each other. The violent kind of space missions I outline above are continuing and a major offensive is about to take place. 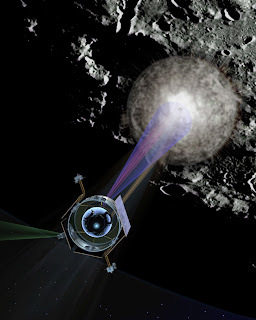 In October 2009, early next month, NASA plan to deploy their Lunar CRater Observation and Sensing Satellite (LCROSS) spacecraft. It is something of a Q-ship of space; dubbed with such an innocuous name. Very Orwellian! See: http://www.telegraph.co.uk/science/space/5566137/Nasa-prepares-to-bomb-the-moon.html . The craft will fire a rocket into the body of the moon at a speed of 5000 miles-per-hour which will result in a titanic explosion rivalling a meteoric impact. Then the craft’s sensors will analyse the ejecta for water and various minerals that future astronauts might find useful… Or at least, this is what NASA claim is the purpose of this mission. It seems to me that the governments of this Earth are trying to provoke the aliens into a war. The LCROSS mission is no less than an interplanetary Pearl Harbour. The aliens don’t appear to be hostile, at least the majority can’t be or we’d all be dead by now! But they are armed and they will retaliate violently to any aggressive action on our part. They not only will, they already have! See this fascinating piece of information from two very good men (Forward-wind to Professor Robert Jacobs’ and Colonel Ross Dedrickson’s statement): The message from the extraterrestrials is clear: “We don’t approve of you using nuclear weapons, but if you insist on using them, keep them on your own planet.” You may find it odd that I use the word “violence” when I describe these space missions, but this is only because of the premise that there is nothing and nobody out there to be violent to, but you’ll now see that that is not the case. The LCROSS strike is an act of war. Why do the Illuminati-occupied governments of this planet want to start a war with our cosmic neighbours? Well, for the same reason that terrestrial governments do: power and control. It could be that the aliens are about to reveal themselves to humanity in general and the Loomies want to stop them. Perhaps they want to goad the aliens into a war which they will then play as a Problem-Reaction-Solution scam. As I said above, political strategies don’t change with time; and I doubt if they change with scale either. What counts for world wars on Earth does also for wars across the Galaxy. We must protest, disassociate ourselves from the acts of our rulers. As the window-posters said during the Iraq invasion: “I AM NOT AT WAR!” The ET’s have so far shown remarkable restraint; they are clearly very astute and they seem to be very perceptive of the situation down here on Terra not-so-Firma. I think we’ve got a good chance of forming a peaceful alliance with them which will scupper the warmongering Illuminati’s plan. I'm very glad you are bringing up this act of terrorism, it really does beggar belief. How many people will think the official reason is ludicrous, but still never think to question? The 40 year anniversary that Ellis mentioned seems significant too esp with an astronaut taking a piece of the moon to the top of Mt Everest this year - "nasty things are afoot at the lunar circle." Yes indeed that is most odd. Why take a piece of lunar rock to the highest point on Earth? I'll have to read what Ellis says about that. I wonder if it'll be REAL moon rock. Some moon rock in a museum has been revealled as a lump of wood! These activities often have several motives, BB... but they're never the ones they say they have in the media!